"Sampath Speaking" - the thoughts of an Insurer from Thiruvallikkeni: preparing good degree Kumbakonam Coffee ~ mathematical code for coffee !! preparing good degree Kumbakonam Coffee ~ mathematical code for coffee !! How good were you in Mathematics in your school days ? and how much did you understand the formulae !! In mathematics, a formula is an entity constructed using the symbols and formation rules of a given logical language – and do you know of the formula for making quality coffee [not the Kumbakonam degree coffee !] Coffee is one of the most widely consumed drinks in the world, with two billion cups drunk worldwide every day. Brewers from every continent have developed a legion of different methods to make the perfect cup, but few have ever put the question to science. Now, researchers from the University of Limmerick have created a mathematical model to help coffee connoisseurs. South Indian coffee (a.k.a filter coffee) is a milk coffee (perfect example of South Indians' affinity for dairy products). Most of the beans are grown in India (Arabica and Robusta varieties are grown in Tamil Nadu primarily at Nilgiris District, Yercaud and Kodaikanal). It is a right mixture of decoction and milk added with sugar, primarily from coffee beans and chicory. There are multinationals too in the market !! 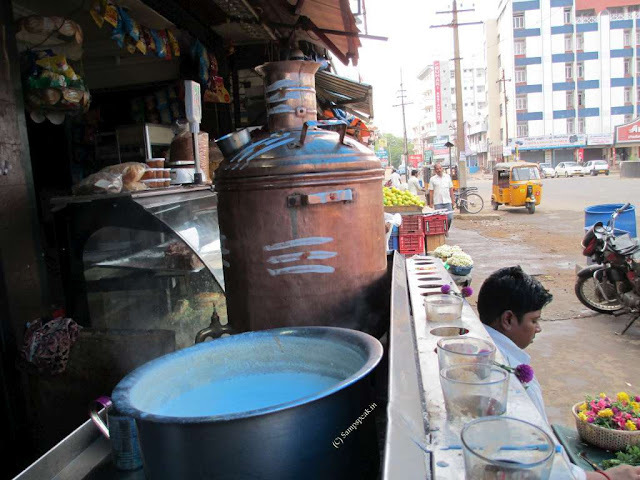 In recent past, on every highway in Tamilnadu, shops calling themselves - original Kumbakonam filter coffee shops have mushroomed. In South Indian culture, the visitor to a House is welcomed and offered a tumbler of coffee. It is an energizer, many have the habit of taking a cup of coffee immediately after consuming their food, especially tiffin items. It is common to see people walking to restaurants / hotels and order only a cup of coffee. For most Indians, especially South Indians, the day begins with a coffee in the morning and perhaps at least two more during the day. At home, it is not simply Coffee, but Filter coffee – made from decoction dripping down from coffee powder made of dark roasted coffee beans, chicory – the hot water percolates through the thick powder solely by gravity and not under pressure. To this decoction, is added milk, enough not to change the colour and aura. The fresh coffee beverage literally wakes you up and makes you open to the day’s realities. Coffee berries, which contain the coffee seeds, are produced by several species of a small evergreen bush of the genus Coffea. One Coffee advertisement used to ask – how much you know about the person whom you love most….. similarly can you instantly list out at least 5 persons whom you love or list out 5 things your city is famous for….In good olden days, whenever people used to travel they used to travel with coffee contained in ‘kooja’ [a special coffee pot] and then with flask-load(s) of coffee… be it a traveller, or somebody making it at home – concocting coffee without spilling … spillage and perhaps liability is altogether a different issue, interesting one at that. Researchers from the University of Limmerick have created a mathematical model to help coffee connoisseurs make the perfect brew. The team hope that their model can make coffee brewing a more precise and accurate process. In an episode of the video series 'Reactions' from the American Chemical Society published online earlier this year, chemistry experts share their tips for making quality coffee. In order to have an accurate coffee to water ratio, the experts suggest skipping the teaspoon and breaking out a scale instead. The quality of water can also dramatically change the flavour, and the Reaction hosts suggest trying bottled or filtered water instead of just tap. The temperature of the water used is key - get as close to 96 degrees Celsius as you can. However, avoid going over 96 degrees, as boiling the water for too long can burn your coffee granules. Now that you have a how-to guide, the vessel you choose to brew your drink can also affect its taste. The pros say pour-it-yourself methods are better than automatic coffee makers, as there is more control over how much water is used. Using mathematical modelling, the Limerick researchers found that a coffee grain's size is very important to its flavour. Smaller granules produce a more bitter coffee, whilst larger granules produce a weaker, smokey taste. The trend is linked to the surface area of each grain and to a step in the brewing process known as 'extraction.' Extraction describes the movement of the coffee from its solid form as a bean into its liquid form when it dissolves into hot water. 'Coffee is a huge business worldwide, but making someone the perfect brew tends to involve a lot of trial and error,' Dr William Lee, co-author of the study and lecturer in the Department of Mathematics and Statistics at the University of Limerick, told MailOnline. 'I love coffee and drink it all the time, so it's fascinating to look at it scientifically. 'The coffee brewing process is currently pretty subjective - we hope to make it more precise. 'We're hoping to one day design coffee machines using precise mathematics, in much the same way that modern sports cars are.' Publishing their findings in the SIAM Journal for Applied Mathematics next week, the researchers put forward a brand new model of coffee extraction that can help brewers in their quest for the world's best coffee. The researchers found that coffee is extracted from bean to water in a two-step process. The team hope to apply a median mathematical model based on grain size to designing high-tech coffee machines that produce coffee with greater precision than ever before. In future, they hope to use mathematical models to unravel more of the many secrets behind more of what makes a coffee great, for instance: how best to lay out the bed of coffee in the filter system. 2nd half of post excerpted from MailOnline.